Buzz! is one of those games that’s only ever dragged out on beer-fuelled evenings, preferably with a group of similarly soused friends. The first outing on PS3, Buzz! Quiz TV, added an online versus mode and the ability to post your own quizzes up for others to try out, which were well received and extended the overall lifespan. Just a year and a half after that game’s release, we have a new stand-alone version – Buzz! Quiz World. Neighbours stalwart Jason Donovan is back again as the titular host, and he’s just as bloody annoying and his hair is just as plastic as ever. Newcomers to the Buzz! franchise should prepare themselves for a cheesy, pun-laden TV quiz experience, with 5,000 questions on a number of subjects presented through various rounds. The rounds themselves are a mixture of the predictable, such as ‘Fastest Finger’ and ‘Stop The Clock’, to the more unusual. For example, ‘Pass The Bomb’ has the contestants throwing an explosive device around. Answer a question right and you can pass it to another player, but if you’re holding it when the thing goes off, you’re out of the round. A couple of new rounds are introduced in Buzz! Quiz World, including one where the answers are gradually revealed a letter at a time, and another where you bet on whether another player will correctly answer the next question. They’re a welcome relief for Buzz! fans who’ve played Quiz TV to death, as is the ability to customise your game to leave out any unfavoured rounds. Also included are a couple of new characters, such as a nurse and a sword-happy knight, and a graphical update for the studio which now has a fully reactive audience. It’s quite upsetting to be mocked by hundreds of creepy avatars when you mistakenly reveal that Spider-Man’s real name is Peter Pecker. One of the more impressive updates is to the player profiles, which now remembers past contestants and their track record. If you’re one of those poor unfortunates that always seems to come last, expect a ton of abuse from Mr Donovan each time you start a new game. Even better, you don’t have to choose a character and buzzer noise every time you play – the game remembers your previous choice and lets you stick with it, or change it if needed. Not a revolutionary change, but it spares some irritation. The online component has also been updated in a number of ways. Now it’s possible to play with up to eight contestants – four local versus four remote. The user quizzes can also be played as part of a game instead of just individually, and as one of a number of different rounds rather than just fastest finger. All very welcome updates, although we did notice that the online games had a lot of lag and ridiculously long loading times some evenings. Buzz! 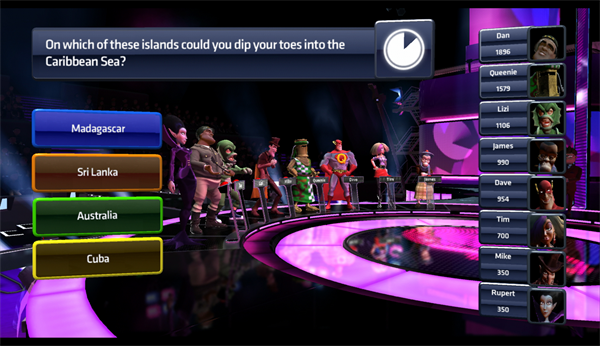 Quiz World is a fantastically fun social game that is highly recommended. However, owners of Buzz! Quiz TV should only consider buying this if they’ve played the original to death and know the questions off by heart. The updates are welcome and definite improvements, but not enough to warrant a purchase by themselves.